Diamond Quality Services is proud to serve the Keller community! About Keller, TX - Happy to be your hometown Heating & Air Conditioning Contractor! Keller is located in Tarrant County, Texas approximately twenty miles north of the city of Fort Worth. Established in 1881 along newly completed tracks of the Texas and Pacific Railroad, Keller was named for John C. Keller, a local railroad foreman who was instrumental in bringing the railroad to the community. At present, the fast-growing city of Keller is home to approximately 40,000 residents, representing a 51% population increase since the year 2000. Keller’s location within the heart of the Dallas/Fort Worth Metroplex provides for easy access to major business and activity centers, DFW International Airport, world-class shopping and dining, and a wealth of opportunities for entertainment and recreation! The city boasts eleven municipal parks situated on 426-acres of prime parkland that feature a variety of recreational amenities for residents of all ages. Parks of note include Keller Sports Park, The Parks at Town Center, and Bear Creek Park, featuring the Big Bear Creek Greenbelt that follows alongside the banks of Big Bear Creek as it meanders for more than five miles through the city’s parks and natural areas. 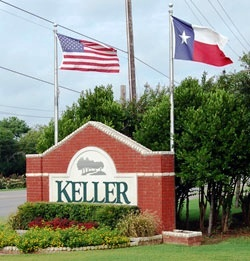 Keller has been named to CNN Money Magazine’s “Top 100 Places to Live — America’s Best Small Towns” every year since the year 2007, with the distinction of placing seventh on the list for 2009. Keller’s friendly citizens, attractive neighborhoods, excellent schools, and outstanding community amenities make it a favorite with residents and visitors alike!